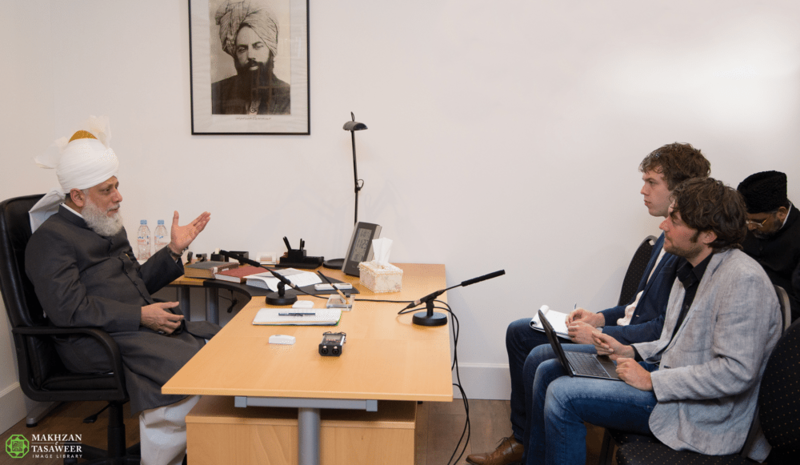 On 6 October 2015, the World Head of the Ahmadiyya Muslim Community, the Fifth Khalifa (Caliph), His Holiness, Hazrat Mirza Masroor Ahmad was interviewed by the Reformatorisch Dagblad newspaper at the Baitun Nur Mosque complex in Nunspeet, Holland. In terms of religious tolerance, His Holiness said that Islam taught that people of different faiths and beliefs should focus on their commonalities, rather than on those issues that set them apart. Reformatorisch Dagblad’s correspondent noted that many extremists sought to justify their heinous acts in the name of Islam and used verses from the Holy Quran to support them. Regarding apostasy in Islam, Hazrat Mirza Masroor Ahmad said that Islam did not permit any form of punishment for apostasy. His Holiness said that the matter remained entirely between an individual and God Almighty and no one else had any right to interfere.